DanaTheTD just put cards in the air for the first of three $110 Satellites for tomorrow's #OneDay100k, one of the most popular tournaments each year on the TVPokerRoom calendar. Start the satellite with 10,000 chips and play 15-minute levels. 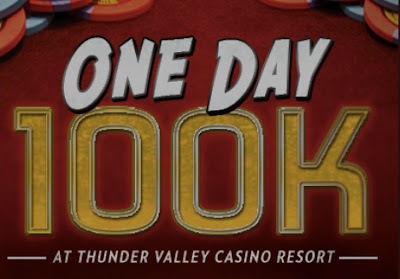 1-in-5 entries wins a seat in to the 11am Saturday OneDay$100,000 Guaranteed $460. Less than one level in and this satellite is already up to awarding 9 seats. There's two additional $110 satellites tonight - at 6pm and 8pm - following the same structure. Registration for the 6pm satellite closes at 7:40pm, while registration for the last satty of the night closes at 9:40pm. There's a Last Chance Turbo Satellite Saturday at 9am, registration for that one closing at 10:10am.